Indirect heating systems transfer the heat from combustion sources such as fuel or electric heating elements to hot oil or any other thermal fluid. This heat is then carried to the heat users (or exchangers) such as reactor jackets, presses, calendar rolls, molds or industrial fryers. In this way, the temperatures are maintained precisely. Heat transfer oils are generally petroleum based and when they are exposed to high temperatures, air or poorly designed circulation piping systems, the oil degrades and by-products such as soot, carbon, coke or sludge are formed. These solid particles circulate all over the process. The contaminants foul the heat exchangers and heater elements and the overall efficiency of the heat transfer is reduced. This in turn leads to higher operating costs, higher cost of maintenance, unscheduled downtime and the risk of a fire. In order to improve heat transfer efficiency, it is necessary to implement proper filtration of the thermal oil. An industrial hot oil filter system usually operates on a side stream basis, at operating temperatures and while processes are running. Heat transfer fluids have a lower viscosity at higher temperatures making the capture and removal of contaminants easier and more effective. Fouling by thermal contamination – The majority of solids formation and fouling in thermal fluid heat transfer systems is caused by air infiltration that oxidizes the fluid. The source of air infiltration is usually through the use of an open to atmosphere expansion tank. This causes oxidation of the organic fluids and insolubles are formed. The rate of formation of these insolubles depends upon the amount of air exposure and the temperature of the fluid in the expansion tank. The mild acids that are created due to the oxidation and moisture result in the formation of corrosion products and rust. All of this sludge deposits and collects on the heat transfer surfaces. Fouling by thermal overheating – Thermal decomposition (TD) of organic thermal liquids results from the heat source driving the fluid temperature above its thermal decomposition limit. Exceeding the design operating conditions via excessive heat flux or restricted flow where the heat source wall temperature rises above the TD limit causes overheating. This autocatalytic decomposition results in surface coking. Thermal cracking results in impurities in the heat transfer fluids and further accelerates coking. Sludge is formed due to the accumulation of coking solids, reducing the fluid flow velocity to the heat source and causing the wall temperature to rise above the TD limit, hence causing rapid fouling. A simple thermal fluid filtration system can help return fouled systems to proper operating condition and work to extend the useful life of the fluid. Liquid Process Systems provides industrial filtration systems that are extremely efficient for cleaning and maintaining the efficiency of heat transfer fluids, thermal or hot oils. High quality filter elements are used to enhance optimum cleaning of the oil at elevated temperatures. 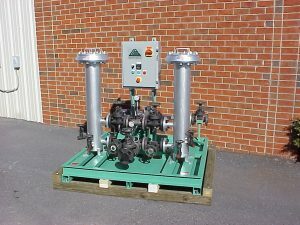 The elements that are used for hot oil filtration have excellent dirt-holding capacity, are economical and disposable. The regular operation of the hot oil recirculation system and heat users are not interfered with. The fluid is efficiently drawn into the filter unit by tapping off from the existing piping, diverting a percentage of the main flow to the filter unit and then re-introducing the clean fluid back into the hot oil heating system process lines. 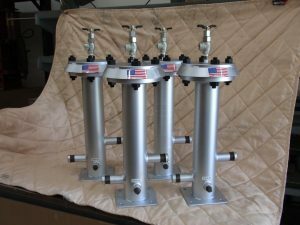 The SENTINEL series is a stand alone system with its own pump and control panel that recirculates a portion of the fluid through the filter unit and discharges the clean fluid into the main piping. The VECTOR series has the same filtering capability but instead uses the existing thermal fluid system pump to recirculate a portion of the fluid from the pump discharge through the filter and then to the pump suction. Introducing these efficient side stream thermal fluid filter systems changes the viscosity of the fluid and effectively reduces the Total Acid Number of the oil. The specific gravity of the fluid is changed, and the fluid degradation is reduced increasing the heat transfer efficiency. Above all, the cost of replacing the heat transfer fluid and the cost of operating the heating system are drastically reduced. The hot oil pump life is increased at least 3 times and the overall efficiency of the heating system increases many-fold, preventing unscheduled maintenance downtime.